Married Name circa 1907 As of circa 1907,her married name was Pritchett. Emma Henrietta Steinkoenig was born on 22 October 1887 at Illinois. She married John R. Pritchett circa 1907. Emma Henrietta Steinkoenig died in April 1975 at Illinois at age 87. Emma Henrietta Steinkoenig had 1 with 1 living in 1910 children. [S244] U.S. Federal Census 1910 U.S. Federal Census, by Ancestry.com, Year: 1910; Census Place: Highland Ward 1, Madison, Illinois; Roll T624_310; Page: 3A; Enumeration District: 44; Image: 493. Cora Pritchett was born circa 1909 at Illinois. She was the daughter of John R. Pritchett and Emma Henrietta Steinkoenig. Charles Mattes married Anna Katherine Baumbach, daughter of Guido Baumbach Jr. and Dorthea Elizabeth Katzman. William Jacob Bender married Emma Amelia Baumbach, daughter of Guido Baumbach Jr. and Dorthea Elizabeth Katzman. Cassie Baumbach was born in 1857. She was the daughter of Guido Baumbach Jr. and Dorthea Elizabeth Katzman. Cassie Baumbach died in 1860. Simon Uhler married Malinda Baumbach, daughter of Guido Baumbach Jr. and Dorthea Elizabeth Katzman. John Sellers married Eleanor Baumbach, daughter of Guido Baumbach Jr. and Dorthea Elizabeth Katzman. Married Name Her married name was Knuth. Ramona Kathleen Walsh married Howard James Knuth, son of Emil Wilhelm Karl Knuth and Theresa Fitzgerald. Ramona Kathleen Walsh was born on 21 September 1928 at Sauk, Wisconsin. She died on 18 January 2001 at Sauk, Wisconsin, at age 72. Name Variation Elizabeth Barger was also known as Betty. Married Name 27 February 1941 As of 27 February 1941,her married name was Peterson. Elizabeth Barger married Keith O. Peterson, son of Harold Windom Peterson and Theodosia Spensley, on 27 February 1941 at Nebraska. Elizabeth Barger died on 23 March 2004. James Mason Spensley was born in May 1852 at Iowa. He married Virginia Josephine Buckingham circa 1877. James Mason Spensley died after 1910. [S246] U.S. Federal Census 1880 U.S. Federal Census, by Ancestry.com, NA Film Number T9-0112 Page Number 391D. [S245] U.S. Federal Census 1900 U.S. Federal Census, by Ancestry.com, Year: 1900; Census Place: Vermillion, Clay, South Dakota; Roll T623_1548; Page: 8B; Enumeration District: 99. [S244] U.S. Federal Census 1910 U.S. Federal Census, by Ancestry.com, Year: 1910; Census Place: Vermillion Ward 2, Clay, South Dakota; Roll T624_1478; Page: 10A; Enumeration District: 118; Image: 1055. Name Variation Virginia Josephine Buckingham was also known as Jennie. Married Name circa 1877 As of circa 1877,her married name was Spensley. Virginia Josephine Buckingham was born in August 1851 at Iowa. She married James Mason Spensley circa 1877. Virginia Josephine Buckingham died after 1910. Virginia Josephine Buckingham had 5 with 5 living in 1900 children. Name Variation James Elmer Spensley was also known as Elmer. James Elmer Spensley was born on 4 January 1880 at South Dakota also reported as Iowa. He was the son of James Mason Spensley and Virginia Josephine Buckingham. James Elmer Spensley married unknown (?) before September 1918. On 12 September 1918 at World War I Draft Registration, Clay, South Dakota. Ella M. Spensley was born in November 1881 at South Dakota. She was the daughter of James Mason Spensley and Virginia Josephine Buckingham. Merril Spensley was born in February 1896 at South Dakota. Lottie P. Spensley was born circa 1878 at Iowa. Married Name before September 1918 As of before September 1918,her married name was Spensley. Unknown (?) married James Elmer Spensley, son of James Mason Spensley and Virginia Josephine Buckingham, before September 1918. Beulah Berthenau Crotchett was born before 1900. She was the daughter of James S. Crotchett and Anna Roe. William J. Crotchett was born in October 1887 at Kentucky. He was the son of James S. Crotchett and Anna Roe. [S245] U.S. Federal Census 1900 U.S. Federal Census, by Ancestry.com, Year: 1900; Census Place: Dyers Hill, Livingston, Kentucky; Roll T623_ 539; Page: 7B; Enumeration District: 56. Henry Engelbert Langkamp was born on 13 October 1907 at Platteville, Grant, Wisconsin. He was the son of Henry S. Langkamp and Anna Gertrude Reuter. 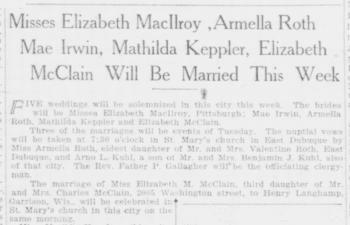 Henry Engelbert Langkamp married Elizabeth Mary McClain, daughter of Charles LeRoy McClain and Mary May Kreiser, on 6 September 1927 Elizabeth McClain - Henry Langkamp wedding announcement. Henry Engelbert Langkamp died on 4 September 1957 at Platteville, Grant, Wisconsin, at age 49. He was buried after 4 September 1957 at Saint Andrews Cemetery, Grant, Wisconsin. 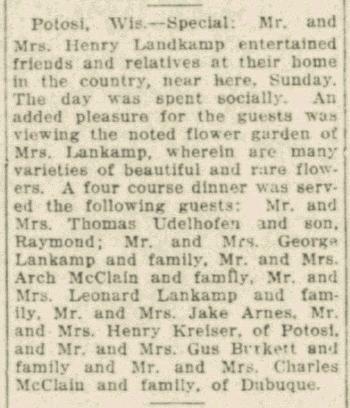 In October 1929 at Grant, Wisconsin, Henry and Elizabeth (McClain) Langkamp entertained friends and relatives at their home, including McClains, Langkamps and Kreisers. [S250] U.S. Federal Census 1930 U.S. Federal Census, by Ancestry.com, Year: 1930; Census Place: Harrison, Grant, Wisconsin; Roll 2574; Page: 4A; Enumeration District: 17; Image: 272.0. [S373] U.S. Federal Census 1940 U.S. Federal Census, by Ancestry.com, Year: 1940; Census Place: Harrison, Grant, Wisconsin; Roll: T627_4481; Page: 2A; Enumeration District: 22-17. Name Variation George Henry Chappell Jr. was also known as Chip. George Henry Chappell Jr. was born on 5 September 1922 at Wisconsin. He was the son of George Henry Chappell Sr. and Stella D. Jaecklin. 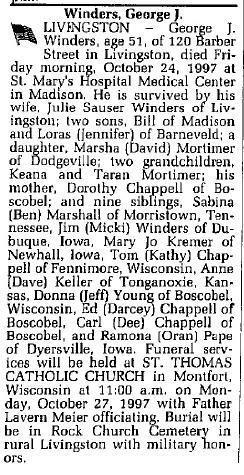 George Henry Chappell Jr. married Dorothy Gladys McClain, daughter of Charles LeRoy McClain and Mary May Kreiser, on 20 June 1953 at Dubuque, Dubuque, Iowa. George Henry Chappell Jr. died on 25 September 1994 at Boscobel, Grant, Wisconsin, at age 72. 1 January 1925 Dubuque Precinct 2, Dubuque, Iowa George Henry Chappell Jr. appeared on the census of 1 January 1925 in the household of George Henry Chappell Sr. at Dubuque Precinct 2, Dubuque, Iowa. George Joseph Winders Sr. was born in 1920 at Iowa. He married Dorothy Gladys McClain, daughter of Charles LeRoy McClain and Mary May Kreiser, on 30 August 1941 at Dubuque, Dubuque, Iowa. 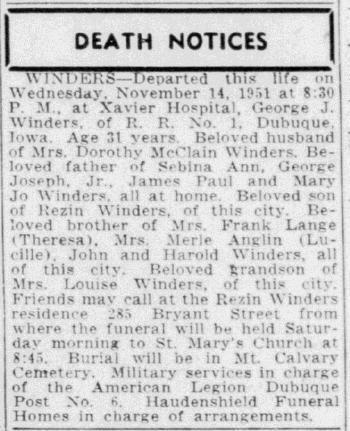 George Joseph Winders Sr. died on 14 November 1951 at Boscobel, Grant, Wisconsin, George Joseph Winders obituary. He was buried after 14 November 1951 at Mount Calvary Cemetery, Dubuque, Dubuque, Iowa. Married Name 1962 As of 1962,her married name was Hinkel. Married Name circa 1983 As of circa 1983,her married name was Marshall. Sabina Ann Winders was born on 25 August 1942 at Boscobel, Grant, Wisconsin. She was the daughter of George Joseph Winders Sr. and Dorothy Gladys McClain. Sabina Ann Winders married Ervin D. Hinkel in 1962. Sabina Ann Winders died on 25 October 2006 at age 64 Sabina Ann Marshall, 64, of rural Blue River, died Wednesday, Oct. 25, 2006, at home. Memorial services will be at 10:45 a.m. Saturday at St. Mary's Catholic Church, Richland Center, with the Rev. Emmanuel Famiyeh officiating. The Pratt Funeral Service, Richland Center, is in charge of arrangements. Sabina worked as a sewing supervisor for Johnson Controls. She was born in Dubuque, Iowa on August 25, 1942 to George and Dorothy (McClain) Winders. Sabina worked as a sewing supervisor for Johnson Controls. She is survived by her husband of 23 years, Benjamin Marshall. 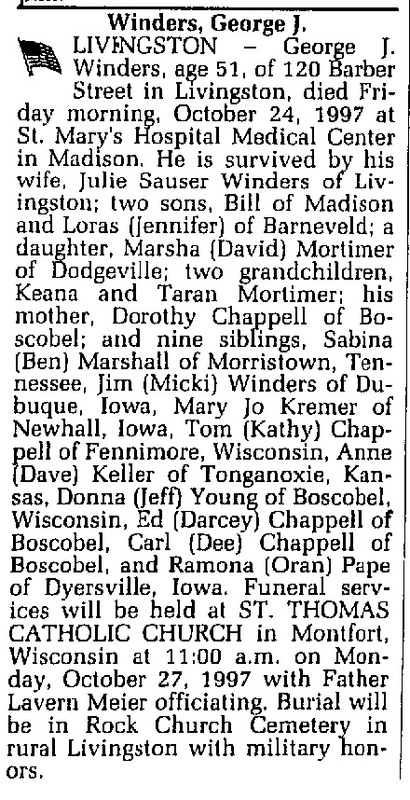 3 daughters: Angel (Arnie) Hatfield of La Farge, Karla (Greg) Martin of Lone Rock, Amy (James) Lortz of Sextonville, Step Children: Deb Jacobson, Marc Hinkle, Mike Hinkle, Linda Volden, Benjamin Marshall, David Marshall, 13 Grandchildren, 4 sisters: Mary Jo (Richard) Mantz of Cedar Rapids, Iowa, Ann (Dave) Keller of Tonganoxie, Kansas, Donna (Jeff) Young of Boscobel, Ramona (Oran) Pape of Dyersville, Iowa, 3 brothers: Tom (Kathy) Chapel of Fennimore, Ed (Darcy) Chapel of Boscobel, Carl (Dee) Chapel of Boscobel, 2 sisters-in-law: Julie Winders and Mickey Winders. Several nieces and nephews and many friends. She was preceded in death by her daughter, Wendy and her brothers, George and Jim Winders. A memorial service will be held at St. Mary’s Catholic Church in Richland Center, WI at 10:45 am on Saturday, November 4, 2006. Fr. Emmanuel Famiyeh will officiate. The Pratt Funeral Service of Richland Center is assisting the family with their arrangements. Name Variation George Joseph Winders Jr. was also known as George A.
George Joseph Winders Jr. was born on 31 October 1945 at Boscobel, Grant, Wisconsin. He was the son of George Joseph Winders Sr. and Dorothy Gladys McClain. George Joseph Winders Jr. died on 24 October 1997 at Madison, Dane, Wisconsin, at age 51 George Joseph Winders obituary. Name Variation James Paul Winders was also known as Jim. James Paul Winders was born on 28 January 1949 at Boscobel, Grant, Wisconsin. James Paul Winders died on 4 July 2003 at age 54 James P. "Jim" Winders, 54, of 14459 Republic Drive, formerly of 1050 N. Booth St., died at 12:54 a.m. Friday, July 4, 2003, at The Finley Hospital, Dubuque. Services will be at 11 a.m. Monday at St. John the Baptist Catholic Church, Peosta, Iowa. Burial will be in St. John the Baptist Cemetery, Centralia, Iowa, where military rites will be accorded by the Tri-State Vietnam Veterans Association and the Dubuque Marine Corps League. Friends may call from 2 to 8 p.m. today at Egelhof, Siegert & Casper Westview Funeral Home, 2659 Kennedy Road, where there will be a parish scripture wake service at 8 p.m.
Mr. Winders worked at Peoples Natural Gas from 1971 to 1999. Most recently, Jim worked surveillance at the Diamond Jo Casino. He was born on Jan. 28, 1949, in Dubuque, son of George and Dorothy (McClain) Winders. On May 15, 1971, Jim married Mickie Dardis at St. John the Baptist Catholic Church in Peosta. Jim grew up in rural Dubuque, and graduated from Dubuque Senior High School in 1967. He attended Iowa State University, Ames, prior to being drafted. He served with the Army during the Vietnam War. He enjoyed cooking, fishing, golfing and spending time with his family. Jim will be sadly missed by all who loved him. Surviving are his wife, Mickie, of Dubuque; two sons, Jeff (Elizabeth) Winders, of Marion, Iowa, and Josh Winders, of Iowa City; his mother, Dorothy (McClain-Winders) Chappell, of Boscobel, Wis; two grandchildren, Jace and Casey Winders; a special niece, Shelby Stroehle, of Coralville, Iowa; three brothers, Tom (Kathy) Chappell, of Fennimore, Wis., and Ed (Darcy) Chappell and Carl (Dee) Chappell, both of Boscobel; five sisters, Sabina (Ben) Marshall, of Indiana, Mary Kremer, of Cedar Rapids, Iowa, Ann (Dave) Keller, of Kansas City, Mo., Donna (Jeff) Young, of Boscobel, and Ramona (Oran) Pape, of Dyersville, Iowa; a sister-in-law, Julie Winders, of Livingston, Wis; and many nieces and nephews. He was preceded in death by his father, George Winders Sr; his stepfather, George Chappell; and a brother, George Winders Jr. In lieu of flowers, a Jim Winders Memorial Fund has been established. Mickie, Jeff and Josh would like to thank their friends and family for all the support given to them over the past several days. A special thank-you also to Officer Todd George; the Epworth Fire and Rescue Squad; Chaplain David Pacholke; Dr. Manternach; LuAnn Ambrosy and the entire ER staff; and Finley Hospital for the wonderful care given to Jim. Name Variation George Henry Chappell Sr. was also known as Chappel. George Henry Chappell Sr. was born on 14 November 1897 at Iowa. He was the son of Gilbert Chappell and Amelia Sulle. George Henry Chappell Sr. married Stella D. Jaecklin, daughter of Henry Jaecklin and Etta Henkel, on 26 May 1921 at Dubuque, Iowa. George Henry Chappell Sr. died in May 1972 at age 74. 1 January 1925 Dubuque Precinct 2, Dubuque, Iowa George Henry Chappell Sr. appeared on the census of 1 January 1925 at Dubuque Precinct 2, Dubuque, Iowa. George Henry Chappell Sr. obtained US Social Security Card at Iowa; last residence Dubuque, Dubuque, Iowa. In May 1971 Mr and Mrs George H Chappell (Stella Jecklin) 50th wedding anniversary. Name Variation Stella D. Jaecklin was also known as Jecklin. Married Name 26 May 1921 As of 26 May 1921,her married name was Chappell. Stella D. Jaecklin was born on 23 March 1897 at Dubuque, Iowa. She was the daughter of Henry Jaecklin and Etta Henkel. 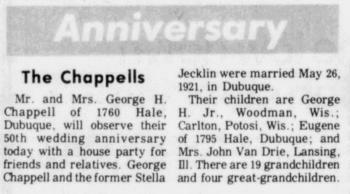 Stella D. Jaecklin married George Henry Chappell Sr., son of Gilbert Chappell and Amelia Sulle, on 26 May 1921 at Dubuque, Iowa. Stella D. Jaecklin died in December 1978 at age 81. 1 January 1925 Dubuque Precinct 2, Dubuque, Iowa Stella D. Jaecklin appeared on the census of 1 January 1925 in the household of George Henry Chappell Sr. at Dubuque Precinct 2, Dubuque, Iowa. Stella D. Jaecklin obtained US Social Security Card at Iowa; last residence Dubuque, Dubuque, Iowa. In May 1971 Mr and Mrs George H Chappell (Stella Jecklin) 50th wedding anniversary. Children of Stella D. Jaecklin and George Henry Chappell Sr.
Albert Meyer was born on 22 April 1887 at Wisconsin. He was the son of (?) Meyer. Albert Meyer married Elise Schlieckau, daughter of Henry Schlieckau II and Mary Catherine Hahn, circa 1918. Albert Meyer died in October 1968 at age 81 Albert Meyer obituary. Albert Meyer obtained US Social Security Card at Wisconsin; last residence Loganville, Sauk, Wisconsin. On 5 June 1917 at World War I Draft Registration, Sauk, Wisconsin. [S243] U.S. Federal Census 1920 U.S. Federal Census, by Ancestry.com, Year: 1920;Census Place: Westfield, Sauk, Wisconsin; Roll T625_2015; Page: 4B; Enumeration District: 171; Image: 271. [S250] U.S. Federal Census 1930 U.S. Federal Census, by Ancestry.com, Year: 1930; Census Place: Westfield, Sauk, Wisconsin; Roll 2609; Page: 1A; Enumeration District: 39; Image: 516.0. Name Variation Dorothy E. Meyer was also known as Dorothea. Married Name 4 October 1942 As of 4 October 1942,her married name was Theis. Dorothy E. Meyer was born on 25 June 1922 at Westfield, Sauk, Wisconsin. She was the daughter of Albert Meyer and Elise Schlieckau. Dorothy E. Meyer married August Herman Thies, son of August Thies and Dora Meyer, on 4 October 1942. Dorothy E. Meyer died on 20 October 2009 at age 87 Dorothy E. Thies, age 87, of Reedsburg, died unexpectedly on Tuesday, October 20, 2009 in her home. She was born on June 25, 1922 in the Town of Westfield, Sauk County, the daughter of Albert and Elsie (Schlieckau) Meyer. On October 4, 1942, she was united in marriage to August H. Thies. Dorothy was a member of St. Peter's Lutheran Church in Loganville where she sang in the church choir, was active in the women's bible study and the quilting group. She enjoyed painting, gardening, embroidery and sewing. Survivors include two brothers-in-law: Adelmar Knuth, of Reedsburg and Norbert Paulus, of Spring Green; one sister-in-law: Nancy Thies, of Loveland, Colorado; many nieces and nephews; other relatives and friends. She was preceded in death by her husband, August, on February 28, 1994; her daughter: Marilyn Thies; three sisters: Eugenia Paulus, Esther Knuth and Emma Knuth; and one brother: Alfred Meyer. Funeral services will be conducted at 11:00 A.M. on Friday, October 23, 2009 at ST. PETER'S LUTHERAN CHURCH in Loganville with Pastor Christopher Miller officiating. Interment will be in St. Peter's Cemetery. The family will receive friends from 5:00 P.M. until 7:00 P.M. on Thursday at the HOOF FUNERAL HOME in Reedsburg. In lieu of flowers, memorials to St. Peter's Lutheran Church would be appreciated. The Hoof Funeral Home is serving the family. She was buried after 20 October 2009 at Saint Peters Lutheran Church Cemetery, Loganville, Sauk, Wisconsin. Dorothy E. Meyer obtained US Social Security Card at Wisconsin; last residence Reedsburg, Sauk, Wisconsin. Married Name 24 July 1943 As of 24 July 1943,her married name was Paulus. Eugenia Anna Meyer was born on 27 August 1924 at Sauk, Wisconsin. Eugenia Anna Meyer married Norbert Joseph Paulus, son of Albert J. Paulus and Caroline Haas, on 24 July 1943. Eugenia Anna Meyer died on 6 August 2009 at age 84 Eugenia Anna Paulus, age 84, of Spring Green, passed away on Thursday, Aug. 6, 2009, at the Greenway Manor in Spring Green. A Mass of Christian Burial will be held on Tuesday, Aug. 11, 2009, at 11 a.m. at ST. JOHN' S CATHOLIC CHURCH in Spring Green. Father Mike Resop will officiate with burial in the church cemetery. Visitation will be held on Tuesday at the church from 9 a.m. until 10:45 a.m. when sharing of memories will begin. Eugenia Anna Meyer obtained US Social Security Card at Wisconsin; last residence Spring Green, Sauk, Wisconsin. Name Variation Caroline Haas was also known as Carrie. Married Name circa 1910 As of circa 1910,her married name was Paulus. Caroline Haas was born circa 1892 at Wisconsin. She married Albert J. Paulus, son of Michael Paulus and Catherine Ring, circa 1910. [S250] U.S. Federal Census 1930 U.S. Federal Census, by Ancestry.com, Year: 1930; Census Place: Franklin, Sauk, Wisconsin; Roll: 2609; Page: 5B; Enumeration District: 13; Image: 118.0.